• More Information – industry’s only Clear-Text graphic user interface eliminates blinking lights and error codes and enables operators to select speed & stroke length, operator messages, diagnostics & slicer information. • More Capacity – extended carriage and large platter accommodates large products such as prosciutto, bacon and mortadella. • More Intuitive – color cues the operator to areas designed for proper & safe operation; handles, knobs, etc. • More Convenient Sharpening – top-mounted, one-step sharpening system is easily removed for cleaning and utilizes long-lasting synthetic diamond surfaces. 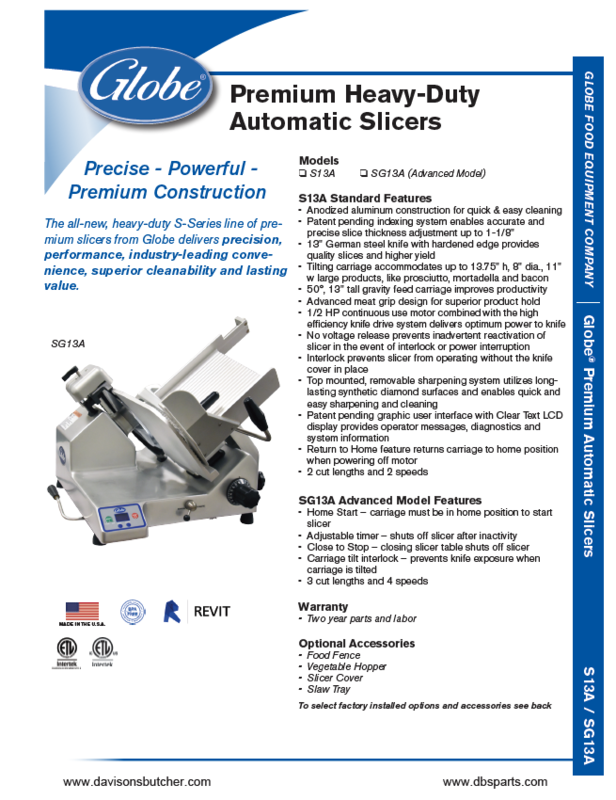 • More Precision – Patent pending indexing system and oversized knob provide precise control for the thinnest slices. • More Consistency – Unique design of meat grip teeth & weighted arm paired with the grooved carriage keeps even the largest product in place. • More Yield – Specially designed carriage and end weight provides better product retention generating higher yield. Knife and sharpening system maintains thinnest edge for a superior slice and improved yield. • More Sanitation – Patent pending one-piece anodized aluminum base provides the most access to typically hard to reach spaces for quick cleanup. • More Convenience – Carriage easily tilts back for convenient cleaning. Remains secured to maintain the precise slicing geometry. • More Access – Slide rod, knife cover & meat grip are quickly removable. All slicers have a kickstand or a lift lever enabling easy countertop cleanup. • More Peace of Mind – 2-year parts & labor warranty is double our key competitors with unparalleled customer support extending beyond the sale. • More Savings – knife and parts replacement costs are lower than the competition. • More Availability – service and parts are available from more sources including multiple local servicers and parts distributors. *Time Out timing is programmable. Factory setting is 30 seconds.